This morning started on a downward note, as one of the trekking team decided that he wanted to head back down, rather than continue onwards. I won’t say who it was, but he’d had a bad night and was concerned about the effects of altitude sickness. Some of the team tried their best to persuade him to continue up with us, or at least to remain in Urdukas for an extra day to rest and acclimatise, but in the end he decided that he wanted to head back. It’s always a great shame when you lose a member of the team – it had been a pleasure getting to know him, and he had seemed very strong, but it just goes to show that altitude can affect anyone, regardless of age, experience or fitness. 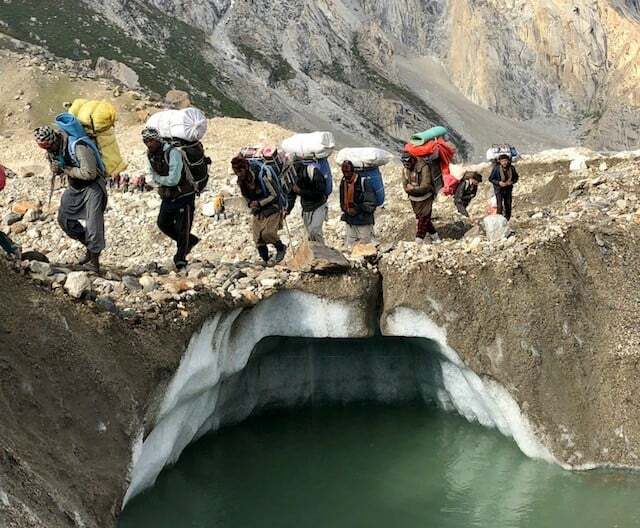 There was another climber with another group in Urdukas, who had been there for a couple of days, as he was really affected by the altitude, and couldn’t continue, and a helicopter was called to evacuate him (as he wasn’t going to be able to make it down on foot). It’s a stark reminder of the invisible enemy up here – and ascending slowly and keeping well hydrated and healthy is the best defence. Immediately out of Urdukas, we were on the glacier, and will be for the rest of the journey to BC. In fact the next time we’ll have solid ground under our feet is when we actually start climbing on the mountain. The vast majority of the glacier is covered with rock and gravel, although countless small streams and rivers reveal the brilliant white ice underneath. The route is windy and the meandering path easy to lose, often barely obvious. I spent much of the morning walking with Paul and Noel, who are on another team. Paul is from Belgium, and Noel, an Irishman who lives in South Africa, who was on K2 back in 2016. It’s great being back on the mountain with Noel again, it’s both of our third time here (for K2) – so it’s nice to know that I’ve another twice frustrated climber who’s determined to make it third time lucky! Goro 2 is not a particularly attractive camp site. Goro means ‘rock’ in Balti, and that about sums up the ground underneath. It’s also pretty dirty – with the litter from countless other expeditions all around, including animal heads, rubbish and a lot of human excrement (there aren’t any toilets here like we’ve had at the previous camps). It does however make up for it in its position, and as the sun came out this afternoon (it had been overcast and snowing this morning), we had the most incredible views of Gasherbrum IV (7925m) to our east, and Masherbrum (7820m) to our SW.
Masherbrum was originally recorded as K1, until the surveyors learnt that it had a local name. 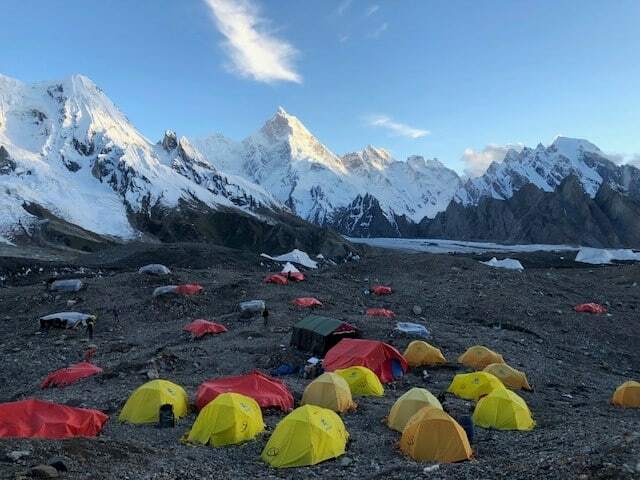 Both of these mountains are a hairs breath under 8000m, and just behind Gasherbrum IV are G1 and G2, which are both 8000m peaks, and two of only 14 in the world. This area has the tightest concentration of 8000m peaks, with 4 (K2, Broad Peak and G1 and G2) within around 20kms. We can just see part of Broad Peak, and tomorrow, as we head up to Concordia, if the weather is clear, we’ll see K2 for the first time. Fingers crossed for good weather!